The MGS Politics Department has a long history of staging political meetings open to the public. But last night’s debate - on ‘Brexit and Beyond: the Future of the Conservative Party’ - was especially memorable. Seldom has the School witnessed a political gathering where the subject was so pervasive, the circumstances so urgent, the timing so pressing and the panellists so compelling. It was therefore pleasing, but hardly surprising, to find almost 150 people – pupils, parents, Old Mancunians and those beyond the MGS community - assembled in the School Theatre to listen, reflect and respond. The panel included two Conservative MPs who, in the 2016 referendum, found themselves on opposite sides. Mary Robinson, MP for Cheadle (57% Remain), reprised her concerns about Brexit and business, while explaining why she thought Theresa May’s ‘deal’ was the correct way forward. Certain members of the audience, who were in the front-line of such business uncertainty, duly offered their own views, leading to a respectful yet robust exchange. Meanwhile, Sir Graham Brady, MP for Altrincham and Sale West (61% Remain), recalled his own long-standing opposition to the EU and why it had been hardened by events since 2016. Sir Graham’s presence on the panel was of particular interest for two further reasons. First, as the author of the ‘Brady Amendment’ (passed by Parliament in January ), he had specific views on how the Irish ‘backstop’ issue could be resolved. Secondly, Sir Graham is chairman of the crucial 1922 Committee: the body of backbench Tory MPs that could yet decide the fate of May’s premiership. In other words, at a time when Parliament was in chaos, one of its most crucial figures was here in the School Theatre, sharing his views about what might happen. The poignancy of this was not lost on audience members. The views of our two MPs were leavened by two academics and a journalist. Prof Tim Bale (Queen Mary University London) warned Conservatives that the loss of support from centrist voters could devastate the party’s electoral prospects, while Prof Robert Ford (University of Manchester and BBC exit pollster) did not discount a further collapse in Tory support among voters aged under 40. By contrast, journalist Patrick Christys (who studied A-Level Politics at MGS 2008-10) offered Conservatives a more cheerful outlook. Patrick argued that, with a more ‘charismatic, and indeed human, party leader’, there was ‘no reason’ why Conservatives at the next election could not reap the victory they squandered in 2017. Thanks to Brexit, British politics now arouses greater public interest than at any point since the War. 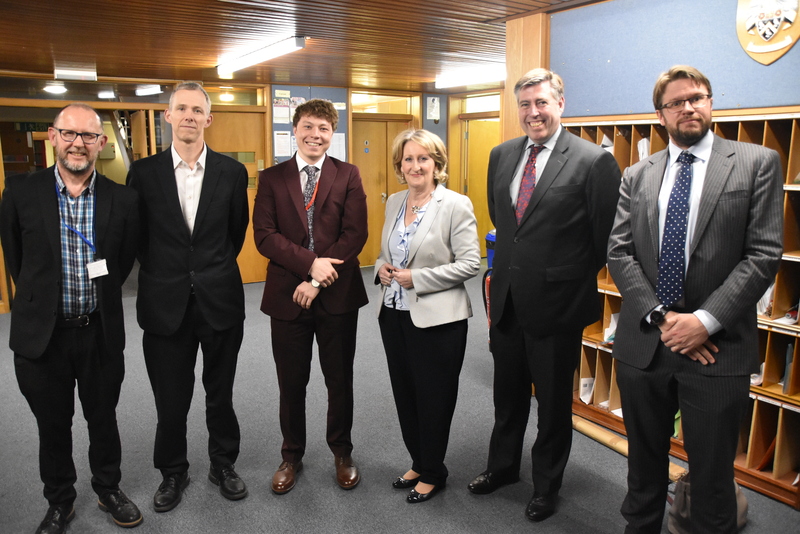 The event that took place at MGS last night – tense, engaging and occasionally disturbing - was the School’s own example of a national phenomenon.